A not-so-funny thing happened during the week before this year's OSP—smoke from the Barry Point fire and other wildfires took over the state. Sometimes the skies were better, and sometimes they were terrible, but they were never smoke-free. Add some clouds, and the observing possibilities were distinctly worse than average. Nevertheless, I attended my 19th OSP in a row, and had a good time. 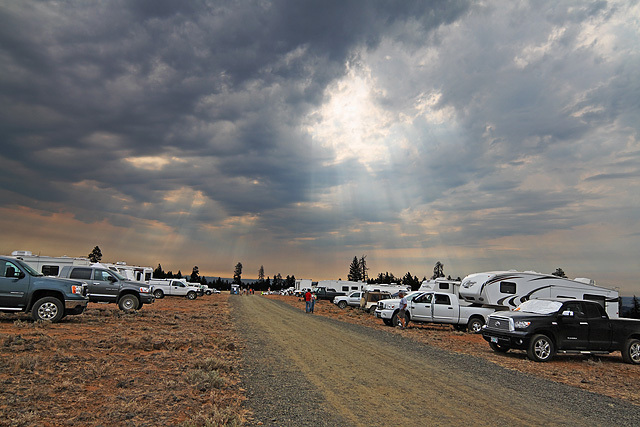 I arrived early Thursday afternoon, and despite the pall of smoke the party got off to a good start with cake and ice cream and reminiscences from Chuck and Judy Dethloff about the 25 years of the Oregon Star Party. The evening started off a bit hazy, with clouds along the southern and western horizons. I did a little bit of observing before the clouds moved in for good. I bedded down and set my alarm for 1am. When I blinked awake at 12:42, I saw the Cygnus Milky Way. Unfortunately, my body was very unhappy at the prospect of getting up, and I didn't manage to drag myself from my sleeping bag until 2:00. At every OSP, I try to track down the visible comets. From C/1994 N1 (Nakamura-Nishimura-Machholz) at my first OSP to last year's close encounter between C/2009 P1 (Garradd) and The Coathanger, OSP has been home to some memorable comet observations. Unfortunately, this year's brightest comets were all faint at around magnitude 11. Additionally, all but one were very low in the sky. With the smoke, would this be a comet-less OSP for me? 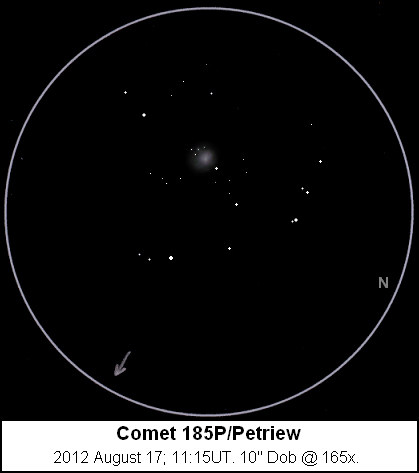 On Friday morning, Comet 185P/Petriew made sure it wasn't. Vance Petriew discovered this comet on August 18, 2001 at a star party in Canada, but it could have been discovered at that year's OSP if someone had been looking in the right spot. Now, a couple of orbits and almost exactly 11 years later, the comet was situated just a few degrees from Venus in the morning sky. Luckily, Venus was far enough away that the morning star's glare didn't impact the comet's visibility. I starhopped and found Comet Petriew readily visible at 76x in a field of faint stars. I increased the power to 165x and made a sketch. The comet was round and about 2' in diameter with a large central condensation and small, faint outer coma. I tried for the other early morning comet, C/2011 UF305 (LINEAR), but twilight was getting too bright. I turned my attention to Jupiter. Excellent detail was visible on the big planet, especially in its northern hemisphere. The North Polar Region showed a partial dark southern border and a couple of dark inner areas. There were two broad, dark northern belts: the constant North Equatorial Belt (NEB) and a thin, pale orange belt to its north. These belts were separated by a thin, cream-colored zone, with a couple of festoons bridging the gap. The NEB was a darker orange-red, with at least 5 distinct projections from its southern edge. The following-most projection was broad and rounded, its preceding edge curling over to partially enclose a bright white bay. Other projections were connected by loops, with festoons reaching southward to meet a pale yellow-orange Equatorial Band in the middle of the creamy Equatorial Zone. At times, the color of the Equatorial Band seemed to cover most of the southern half of the Equatorial Zone. The projections from the NEB had dark barges and bluish spots near their bases. The South Equatorial Belt (SEB) was broad and dark orangish-red. The Great Red Spot Hollow bit into its southern edge near the central meridian. The Spot itself was a very pale orange, with only its southern border well-defined. There was lots of detail in the SEB; unfortunately, the seeing deteriorated during this part of my observation. 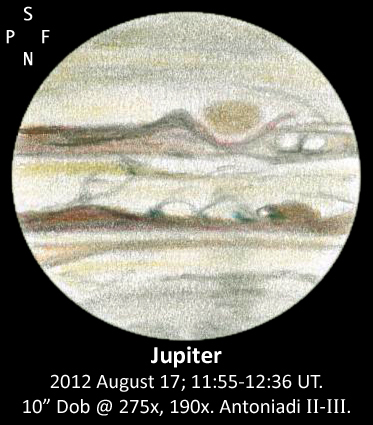 Most notable were a pair of pale white "eyes" staring out of the turbulence following the Great Red Spot Hollow. There was a dark northern border to the South Polar Region following the Great Red Spot. Otherwise, this part of the planet was rather featureless. After Jupiter and Venus, Mercury rose into the twilight among the smoke and retreating clouds. I hit the sleeping bag at 5:30. Friday had some passing high clouds during the day—at one point, I watched Venus emerge from the leg of a wispy, hominid shaped cloud. I drifted down toward Indian Trail Spring to watch and photograph butterflies on the thistle and rabbitbrush. Woodland Skippers were especially numerous. Then I moseyed back to the plateau and decided not to buy anything at the swap meet. I helped Bob McGown hide nickels for his meteorite hunt program, and caught Leo Cavagnaro's presentation on the deep-sky sights within the Large Magellanic Cloud. The day was capped off by the packed-house presentation by astronaut Michael Barratt, featuring rare and exciting video footage from inside a Soyuz re-entry and landing. After dark, skies were similar to Thursday night. I hung out at Dan Gray's camp for a while and looked at a few things, but again the clouds intruded. Just like the night before, I bedded down and woke up to clear skies, finally dragging myself back to my scope around 2am. Sky conditions were similar to the previous morning with a limiting magnitude of 6.7. 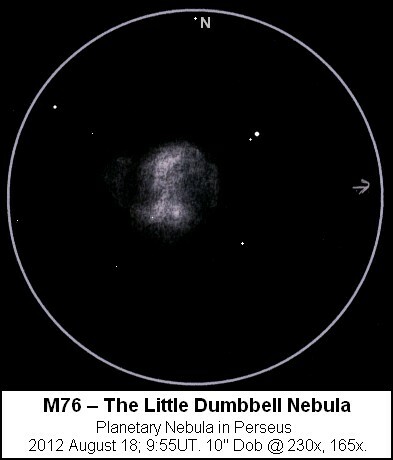 I sketched the Little Dumbbell Nebula, M76. I tried for C/2011 UF305 (LINEAR), low in Ursa Major, but I just couldn't see it. The seeing wasn't as good as on Friday morning, and Jupiter didn't show a lot of detail, so I satisfied myself with a quick look. When I woke up on Saturday morning, the weather had changed, and in addition to the smoke there were dense low clouds. At times, virga was visible below the clouds to the south. There were also sunbreaks. I've seen a lot worse at OSP, so I repeated my hike to the spring. One thing the cloudy skies made sure of—I wouldn't see the young Moon during the daytime, putting the final nail in the coffin of my half-hearted effort to complete the naked-eye advanced observing list. Saturday afternoon, I took my place in the group photo and then made sure my door prize record stretched to 1-for-19. Skies improved throughout the afternoon. By sunset, there were just a few pesky clouds around as well as the omnipresent horizon smoke. A couple of evening comets low in Libra escaped my efforts, and I couldn't even see Comet C/2011 F1 (LINEAR), which I had observed a month earlier from my yard. I took a couple of wide-field camera-on-tripod exposures. Overhead, skies at midnight reached limiting magnitude 7.0, the best of my three nights. Lacking the will to sketch detailed objects, I hunted down some little planetary nebulae instead. IC 348 in Perseus is a reflection nebula involved with a loose group of stars. 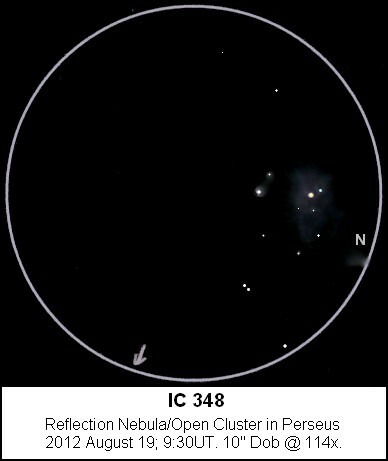 Several patches of nebulosity are visible, although the glare from the bright star Omicron Persei (placed outside the field to the North in my sketch) makes them harder to see. A pair of brighter stars in the middle of the nebula shows a faint orange/blue color contrast. 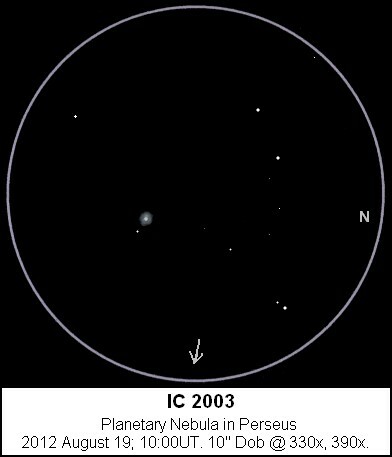 IC 2003 is another small, condensed planetary nebula, located by blinking with an OIII filter. At high power without the filter, it shows a bright round disc that is brighter in the center. At 390x, the central star may be visible. Throughout the early morning, the sky conditions worsened and the sky background turned milky. By the time I got around to Jupiter, it looked inviting but was also dimmed by clouds. I wasn't sure it would remain visible long enough to complete a sketch, so I sleeping bagged it at around 4:30am. Thus ended another OSP for me. 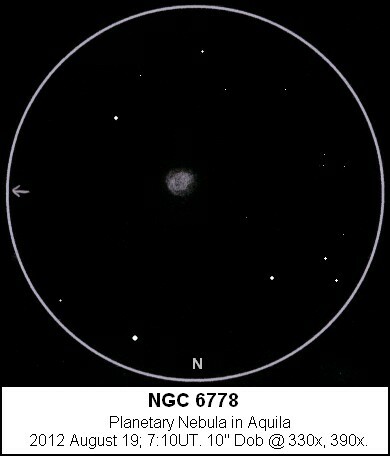 NGC 6778 in Aquila is oval, with fairly low surface brightness overall and a slightly dimmer center. There is a suggestion of a small, faint outer halo, brighter on the western edge. 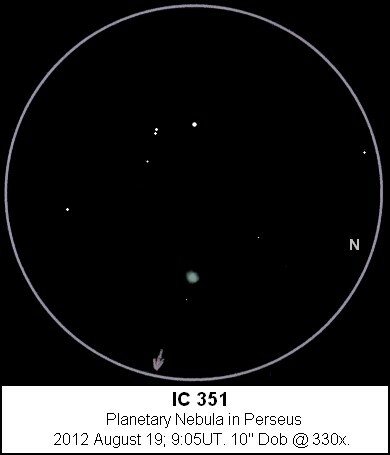 IC 351 in Perseus is a very small, high-surface-brightness planetary, easily picked out of the star field at low power by blinking with an OIII filter. At high power it shows a greenish tint and a small, evenly-lit disc.